Many lovers of British music in particular Vaughan Williams admirers will have been eagerly anticipating this latest Hallé release comprising the Fourth and Sixth Symphonies under Sir Mark Elder. Only the Seventh and Ninth Symphonies, which could be accommodated on a single disc, remain to complete the cycle. Hallé’s tradition of playing Vaughan Williams is a long and enduring one. In my view no other orchestra currently knows his works as intimately and it feels as if the music runs through its veins like lifeblood. Music writer Scott Goddard commented on the “brusqueness” of the Fourth Symphony, describing the music as having “the rasp of a file.” It certainly does exhibit a severe tone, it’s a work of a strong emotional character, unquestionably a towering symphony. The composer once said of his work “I’m not at all sure that I like it myself now. All I know is that it’s what I wanted to do at the time.” When Adrian Boult introduced the F minor score in 1935, many people sensed that Vaughan Williams’ writing reflected the tension of the world situation prevailing in the early nineteen-thirties, conspicuously the rise of National Socialism under Hitler in Germany. Overall Elder displays a calm authority that feels innate, unforced and the dynamic extremes and tempi of the score are judicially managed. The opening movement is launched with gut wrenching power, both visceral and caustic. Entrenched in the Andante moderato is a sense of sinister foreboding, bereft of all hope, accentuated by the desolate flute solo. In the red-blooded Scherzo Elder ensures both reserves of energy and high spirits that engender a sense of springtime freedom. In the thrusting forward momentum of the Finale, in turns unruly and brutal, one feels a strong defiance in the face of terrible adversity. At the conclusion I have heard more violent and sickening hammer blows but none more effective. When Adrian Boult premièred the Sixth Symphony in 1948 it was an instant success, receiving over a hundred performances in its first year. 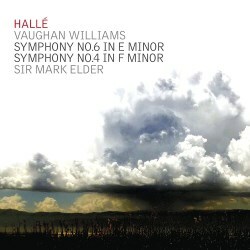 Although Vaughan Williams did not intend the symphony to have a programme, inevitably critics and public alike interpreted the score, with its violence and grinding dissonance, as the composer’s response to the horrors of the Second World War, which had ended with the atomic bombs on Hiroshima and Nagasaki in Japan. Musicologist Deryck Cooke described the effect the symphony had on him as “Nothing short of cataclysmic.” Leopold Stokowski, who in 1949 conducted the first New York performances of the E minor score and made its first recording, was extremely upbeat and stated “this is music that will take its place with the greatest creations of the masters.” Making a terrific impact under Elder’s baton, the Hallé’s performance contains a special frisson with a disturbing menace, yet remains exhilarating. In the opening movement, commencing with a thunderous power so full of angst, catastrophe and martial connotations, the cumulative effect is hair-raising. A sinister tension pervades the Moderato with unsettling murmurings that is almost unbearable. The trumpet blast and the drums lash out an unrelenting and increasingly loud, martial ostinato of an unrelenting disposition. Intense, vociferous and yet mocking, the Scherzo includes notable jazzy syncopations on the saxophone. In Elder’s hands the Finale feels like wandering through a cold, dark landscape laid to waste, completely barren and depleted of any life form. Assuredly, throughout both works Elder maintains steadfast control, pulling everything together and ensuring a splendid internal balance of sound. It seems unfair to single out particular players or various sections for special praise in this highly compelling group performance. Maybe it’s my ears but I am always left wanting a deeper resonance from the Hallé double basses as I have come to expect from the top German orchestras in Berlin, Dresden and Munich. Recorded live at Bridgewater Hall, Manchester, the engineering team provides pleasing sound with presence and clarity revealing fine detail, and well balanced too. There is little in the way of extraneous noise on these live accounts and the applause has been removed. Booklet essays written by the late Michael Kennedy are to the usual scholarly standard, serving to remind me of this much missed figure at Manchester Hallé concerts. On a minor point, it’s puzzling why the symphonies are not ordered chronologically on the disc. There are several excellent recordings of Vaughan Williams’s Fourth and Sixth Symphonies In the catalogue that I turn to first, namely Adrian Boult/New Philharmonia Orchestra on EMI (1967/68) and André Previn/London Symphony Orchestra on RCA Red Seal (1968/69). In the Sixth only, I admire the stunningly played recording by John Barbirolli/Symphonieorchester des Bayerischen Rundfunks on Orfeo (live 1970). Now with these outstanding live accounts of this pair of symphonies, the list of recommendable recordings unquestionably includes Mark Elder and the Hallé. We find this question is not straightforward, since one substantial work can follow another on a CD with scarcely a pause, in a way no composer of Vaughan Williams’s era would have expected. (At least, it would have involved the fumbling turn-over of an LP!) Since selection of tracks is so easy for the listener to manage, it frees up the production process to consider factors other than, say, order of composition, when deciding on a disc’s composition. We agreed with Mark Elder’s feeling that the end of the 4th and similarly violent beginning of the 6th a semitone lower are best separated, and that on CD a reversal of order would be a satisfactory way of appreciating the start of both symphonies.